Start your morning on the southside of the boardwalk at the Halifax Seaport Farmers’ Market. Head over to the Canadian Museum of Immigration at Pier 21 to spend some time learning about the history of the entry point for one in five Canadians between 1928 and 1971. Or, stop into the Discovery Centre—especially entertaining for families interested in learning about how the world works around them. On the other side of Bishop’s Landing is the Sands at Salter, a grassy and sandy section of the waterfront boardwalk that is a popular area for festivals and events. When you get to the north end of the waterfront boardwalk, be sure to take the Sea Bridge if it’s open. The seasonal floating dock stretches from the CSS Acadia to Murphy’s the Cable Wharf, and is crossed by over a million people each year! A morning filled with those activities and walking will work up your appetite! 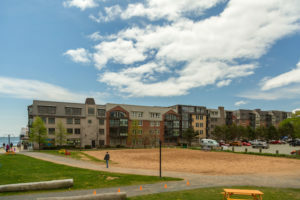 Bishop’s Landing is the epicenter of dining on the Halifax waterfront. From coffee and a muffin to filet mignon and butter-poached lobster, there is something for every palate—right on the boardwalk. Families looking for sweet treats can enjoy hand-paddled ice cream, chocolates, and salt water taffy from Sugah! Confectionary, or cakes and sweets from Piece of Cake Fine Bakery and Cafe. Ristorante a Mano also has a family-friendly menu with handmade pastas and pizzas. On a hot summer day, a light, fresh lunch or juice from Juice Press might be just the ticket to satisfy your hunger. If you want something more, Sea Smoke is an ideal stop for a bite and a drink any day of the week—their large patio and Asian-inspired menu makes it especially perfect in the summer. For a more intimate and luxurious meal experience, The Bicycle Thief and Little Oak both offer curated wine lists, unique cocktails, and exceptional menus—reasons they were both named one of Canada’s Best Restaurants! Some of the best boutique shops along the boardwalk are at Bishop’s Landing. Wrap up your boardwalk stroll finding some gifts for loved ones—and yourself! Pick up some unconventional gifts from L & L Home Shop and some beauty products from Moon Moon Cosmetics. The newest clothing shop at Bishop’s Landing is 4to8 Fashions—a women’s clothing pop-up shop with a curated collection of quality designer samples sold at discount prices. The shop is only there for a limited time, so hurry in! Next time you are planning a stroll along the Halifax waterfront boardwalk, bring the whole family and make a fun-filled day of it! To stay updated on news and events at Bishop’s Landing, follow us on Facebook, Twitter, and Instagram!